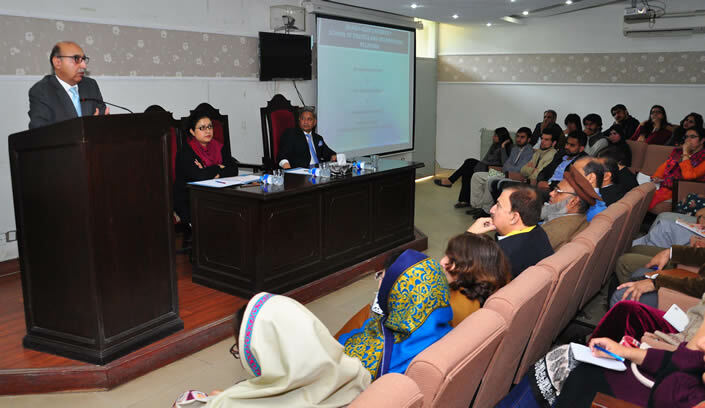 The School of Politics and International Relations organized a talk on “India- Pakistan Relations” which was addressed by Ambassador Abdul Basit, former Pakistan’s High Commissioner to India. He shared his insight regarding his diplomatic assignment as High Commissioner in New Delhi. He said that relations between Pakistan and India have always been challenging but in the contemporary times, the inter-state relations have plunged into deep mutual mistrust and driving them back to normalization is a difficult task. He divulged that at the time of his appointment in New Delhi, it was widely anticipated that BJP would form coalition government as a result of the General Elections of 2014 and the prospects seemed bright for India-Pakistan Relations. However, contrary to the anticipated situation, BJP remained triumphant in securing majority of the votes and forming its Government. With Nawaz Sharif attending the oath-taking ceremony of Prime Minister Narendra Modi, it seemed a God-given opportunity for the resumption of dialogue process between the two states. In spite of this, Indian Foreign Secretary’s visit to Pakistan in August 2014 was cancelled the moment he decided to meet the Kashmiri Hurriyat Leaders in New Delhi. The cancellation of the visit resulted in an immediate realization in Pakistan that the BJP Government was playing gimmicks. 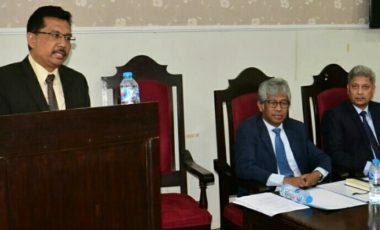 Further, highlighting other major moments in a chronological manner, such as meeting at Ufa on the sidelines of SCO Summit in July 2015, the Climate Change meeting and Hearts of Asia Conference in December 2105, Ambassador Abdul Basit explained how gradually the two states agreed to resume the Comprehensive Bilateral Dialogue. Unfortunately, situation turned bad-to-worse when Pathankot incident took place in January 2016 just weeks before January 15th Indian Foreign Minister’s visit to Pakistan. The tide of events kept on turning towards deteriorated relations in the wake of arrest of Kulbhushan Yadev, Burhan Wani’s extra- judicial killing, ‘Surgical Strikes’ and Uri attack, creating major problems and the resumption of Peace dialogue became a challenge. Amb Basit opined that Confidence Building Measures have diminished importance in the wake of dearth of mutual trust. Anti-Pakistan rhetoric is very strong in BJP government in India and Gujrat Elections, being held next month, and 2019 General Elections are vital for the continuation of BJP’s rule. This electoral politics of being vocal against India as a factor instrumental for the success of political party in General Elections, is no longer a phenomenon visible in Pakistan. Pakistan’s desire is to remain adhered to peace and CBMs and its continued, un-affected implementation of 1974 Protocol for Pilgrims is a glaring example of this. Support for Kashmir is vital for Pakistan and patient policy would be viable towards India to try to bring down the escalation of violence and cross firing on LOC. Options for back-channel diplomacy should always remain open. However, India should be engaged only after it agrees to have a dialogue on Kashmir Issue along with terrorism. Dr. Nazir Hussain, Director SPIR thanked Amb Basit for his candid analysis on the topic as a practitioner. He informed the audience that Amb Basit is an alumnus of IR and this is his homecoming after 40 years. He also informed that Amb Basit, being High Commissioner, had a very difficult task to maintain balance between diplomatic protocols, APHC expectations and national interest of Pakistan.